The meat in this terrine needs to be very finely cubed, but not minced so finely that it loses all texture. Any combination of venison, feathered game and rabbit or hare will be just the thing. Boil the madeira and port in a small pan for 2-3 minutes, until reduced by two-thirds. Cool. Line a slender, 1.3kg loaf tin neatly with foil, leaving enough overhanging the tin to fold back over and enclose the filling. Cover the foil with the streaky bacon, overlapping the rashers, and again overhanging the tin; halve two rashers to line the short ends of the tin. Melt the butter in a small pan and soften the onions for 3-4 minutes, without colouring them. Add the garlic and cook for 2 minutes. Set aside. Preheat the oven to 150°C/gas 2. In a large bowl, combine the game, pork, back bacon, livers, egg, allspice, rosemary, peppercorns, salt, reduced alcohol, onion mixture and a generous grind of black pepper. Pack it into the tin, then give it a whack on a chopping board, to expel any trapped air. Fold the bacon over to cover the filling, then fold over the overhanging foil. Put the tin in a deep roasting tin, then pour around enough just-boiled water to come halfway up. Bake in the oven for about 1 3/4 hours or until a fine skewer inserted into the centre comes out piping hot and the juices run clear. Take the terrine out of the bain-marie, weight it down with a few tins and leave to cool at room temperature for 3–4 hours. Cover (still weighted down) and chill overnight or for up to 2 days. To serve, upturn the terrine onto a board, discard the foil and wipe the terrine clean with kitchen paper if necessary. Slice into 12. 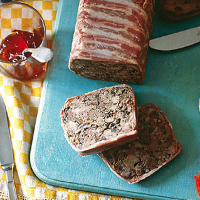 A fresh, lively beaujolais, served lightly chilled, provides the ideal counterpoint for this complex terrine.